Originally from Denver, CO Glee began her equestrian endeavors at the age of three, correctly closing her leg and putting her heels down while astride an overstuffed chair. Graduating to the family's ranch horses, she and her friends galloped through her Cherry Hills neighborhood, where Glee also rode in Pony Club and with the Arapahoe Hunt. At Kent Denver Country Day and in her freshman year at the University of Denver, Glee infused her academic studies with her love of horses by creating her own independent-study riding program. 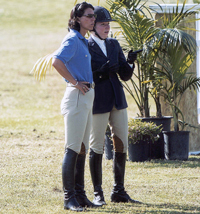 Inspired, she continues to help students from Kent Denver, Logan School, Colorado Academy, Fountain Valley School, Graland Country Day, DU and CU create a personalized independent studies in equestrian development. Her pursuit of a formal arts education led her to Rhode Island School of Design. There, while earning a BFA in photography, Glee taught semi-professionally, exercised racehorses - and began her great love of polo. In fact, her first Grand Prix horse was originally purchased as a polo prospect. 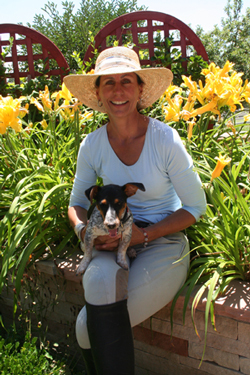 After graduating, Glee returned to Colorado to establish Endeavor Farm LLC and her own career in the Grand Prix show jumping world after her tenure at Littleton Large Animal Clinic as a vet assistant. Though Glee's primary focus is developing athletic show jumpers, hunters and riders; she has experience producing competitive polo ponies, eventers, foxhunters and western riders. Her philosophy of teaching any discipline is rooted deeply in the foundation of classical horsemanship as well as her own interest in the arts. While Glee never pursued a career in the fine arts, her artistic talents shine through on horseback and her creative flare for teaching leads to inspiring and effective lessons. Glee's knowledge of yoga, skiing and cycling are tossed together with a spiritual dressing to make for a most creative and athletic approach to an age-old relationship with our equine friends. One might call it Zen and the Art of Horsemanship, or simply say - as Glee does - "Riding is a very magical kind of performance art."